A buddy and I both punched out early Friday afternoon to go fishing to end a no-fishing streak. Neither of us had been out all September. It was a good choice. The stream we fished in the Whitewater system was still dirty but visibility is at least about 1 meter, so it’s in excellent shape. We started nymphing with only minimal success, switched to buggers then didn’t stop catching fish until we walked off the stream. Each cast turned at least one fish and most casts resulted in a catch. Both black and brown buggers worked well, including many fish on the ivy pheasant craw. There wasn’t much time or desire to grab the camera on this venture, but I did get a couple pics for proof. Gotta love the fall colors of the brown trout. 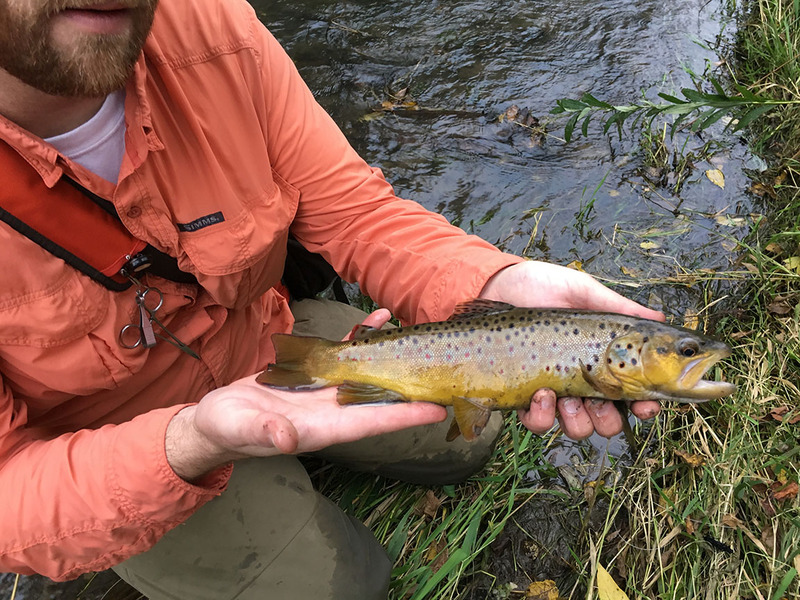 This entry was posted in fly fishing, Stream Conditions, Trip Report on October 1, 2016 by Randy.